A childhood favorite of mine, The Incredible Shrinking Woman was a great showcase for Lily Tomlin with her comedic timing, Jane Wagner's writing, some good special effects, and first-time director Joel Schumacher. 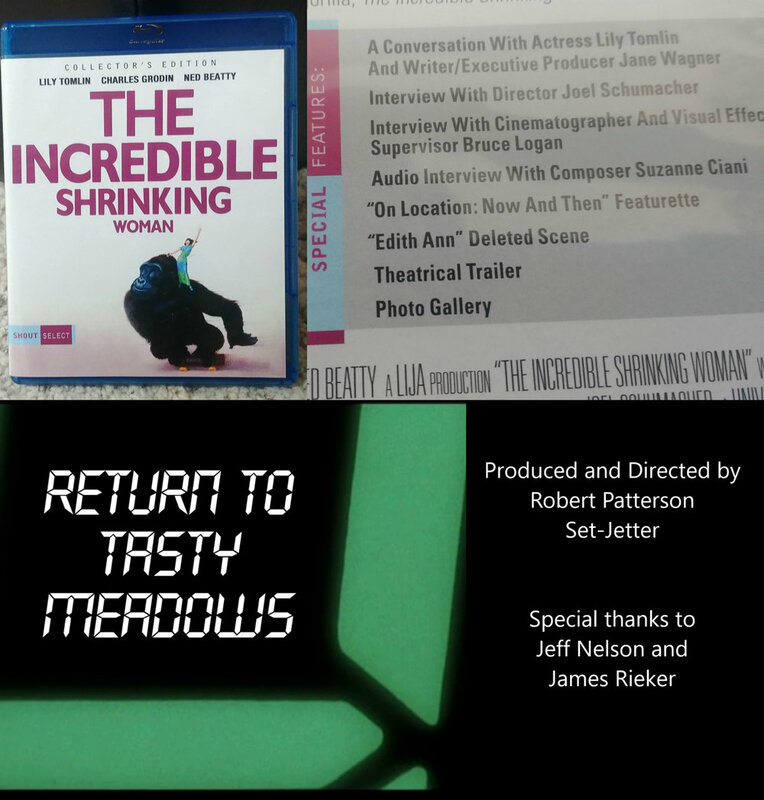 Be sure you check out the new blu-ray for the movie from Shout Factory, featuring my first location video on the special features! It's short and sweet, just like Pat Kramer. Several years ago, when I started getting serious about finding and visiting filming locations, this one was definitely at the top of my list. I had read the grocery store was in Eagle Rock (as well as the house, which turned out to be not true) and the institute was an easy find in Pasadena. Eventually I tracked down the house, but more on that later. 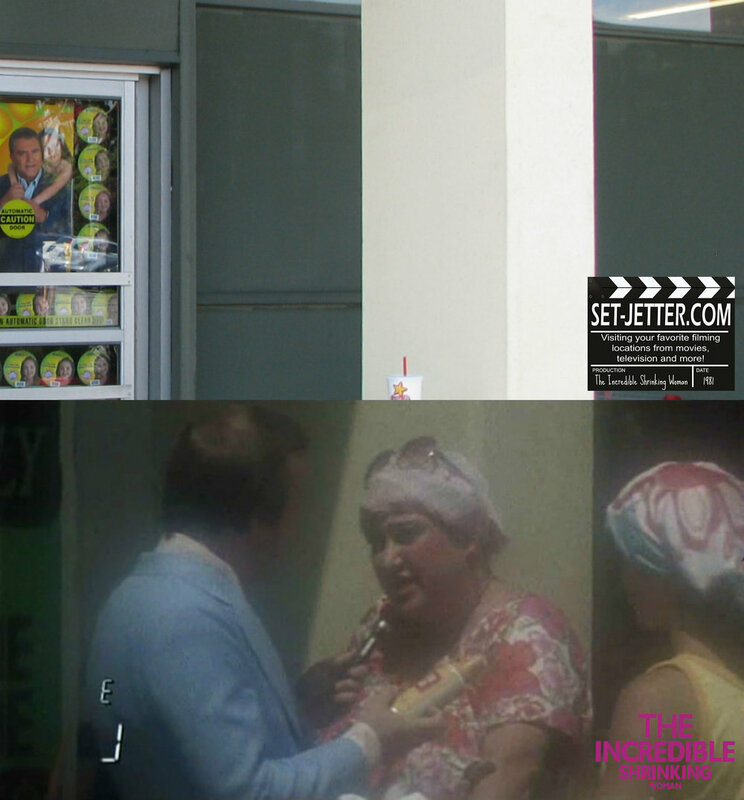 We start the movie at the grocery store, located 2245 Yosemite Drive in Eagle Rock area of Los Angeles. Even in my different visits to this location, the store has changed ownership a few times and unfortunately, doesn't look too much the same as it did three decades ago. I love her "Home Maid Spanish" book! A tradition is to get some 'Cheese Tease' and eat it in front of the store just like the movie. Here is me, my sister, and my friend James having a taste test. Welcome to Tasty Meadows! When I first started looking for the neighborhood, all internet reports that it was also located in Eagle Rock near the grocery store. It was easy to search every cul de sac in the area, but no luck. As I was looking at the house style, I felt it definitely had a 'Mike Brady' look to it so started search around the Studio City area and eventually found it. Here is the entrance to Tasty Meadows, located at the corner of Hesby Street and Whitsett Avenue in the Sherman Village area of Los Angeles. Bad news, since my first visits, they have changed part of the brick wall with the welcome sign. As you can see when you flip through the pictures, they have begun to cut off and step down the bricks on the right side. Pat drives up Hesby Street towards her house, you can see match a few houses on the left side and the light pole on the right in theses shots. All the featured neighbors houses are on this street and actually in the same order as you would drive by them in real life. "Pat, you gotta try Camper Clean! No more ring around the fender, honey." is at 12505 Hesby Street. "Great new diet daiquiri mix at the store, hon." is at 12510 Hesby Street. "Pat, you gotta get some of this stuff for your lawn." is at 12513 Hesby Street. "Ever see our boat look better? Pat, it's Boat Sheen." is at 12516 Hesby Street. "Hey Pat, how about a weenie, huh?" is at 12519 Hesby Street. At last we arrive at the Kramer house located at 12535 Hesby Street. Not much has changed at all with this house and is definitely worth a trip for fans. When Vance comes home that night, he drives by this neighbor's house at 12527 Hesby Street. Tests, tests, and more tests at the Kleinman Institute. Also featured that same year as "Digital Matrix' in Looker, this is located at 1700 Lida Street in Pasadena. These doors are located on the same building on campus. The supermarket incident. Here are a couple of shots of how the store looked several years ago, but at my most recent visit, it has completely changed and not recognizable. Pat is being spied on by this bad guy as he bikes out of store parking lot. 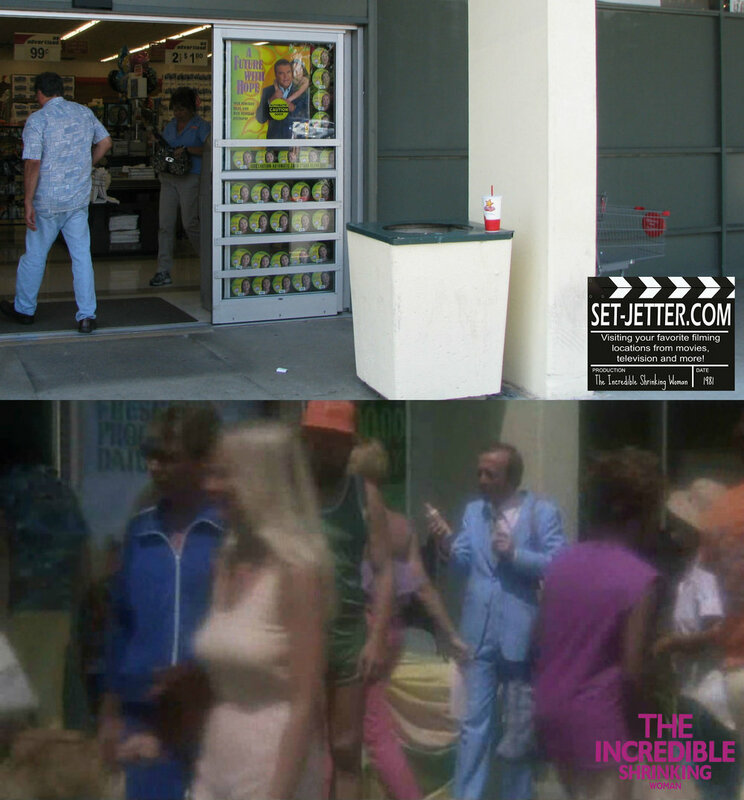 We are back at the shopping center for the finale when Pat and Sidney escape. The exit out of the 'Burger Power' store, located at 4915 Eagle Rock Boulevard. For the final scene, we are back at the house on Hesby Street. I have seen the grocery cart prop several times, the first time during my visit to Universal Studios in 1985 and then decades later. Universal used to have some huge props you could play on, but are now long gone. One of my favorite lines in film: "She's been like a mother to me."